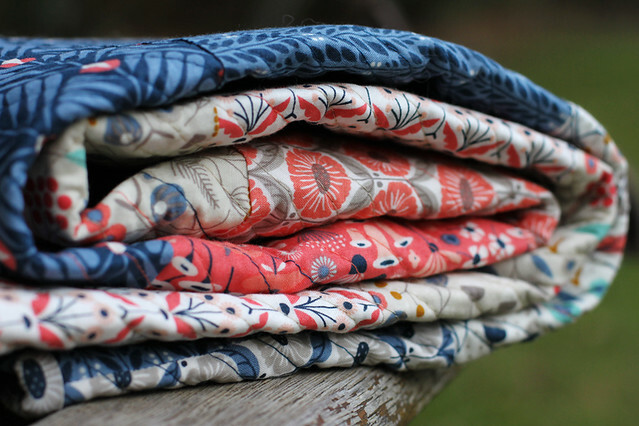 Almost two months ago I was lucky enough to be asked by Sew Mama Sew if I’d like to contribute a project for Cloud 9 Fabrics’ soon-to-be-released fabric line, Wildwood. I said yes please, emailed them an idea and was very excited when I found the project had been accepted to participate in the Wildwood Challenge. The fabric arrived in August and it had the same beautiful, crisp hand I’ve come to expect from Cloud 9 fabrics. The colours are very on trend – love the navy and coral. So, what did I make? A quilt of course! I wanted to keep it simple and show off every single print from the line. I also liked the idea of being able to use a fat quarter bundle. I do love my colour gradations, and that’s what I’ve attempted here. I quilted it with parallel diagonal lines, using my walking foot edge as a guide. 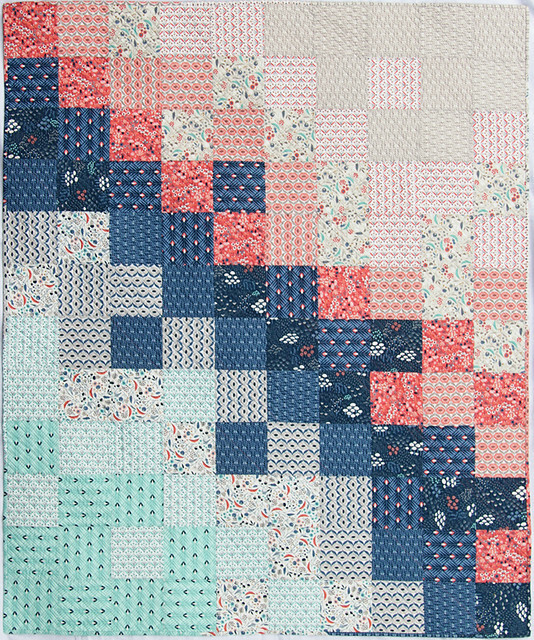 Initially I was going to quilt the whole thing in a neutral beige colour, but when I found I had spools of navy and coral that matched exactly I thought I should incorporate these, too (which I did randomly). I used a scrappy binding, taking the time to match the binding fabric to the fabric at the quilt’s edge (not exactly as I didn’t want overlapping seams, but close enough). I really like the effect. Step 1: Buy a fat quarter of each of the 12 fabrics in the line. a. Reduce all the squares to 5.25″ – then they will fit into the fabric you have available. (This will reduce the final size of the quilt to 47.5″ x 57″ which is still a generous baby quilt size). b. 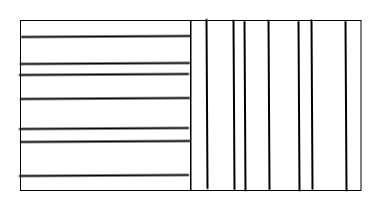 Cut 3 x 5.5″ squares from each row (not 4 as shown above) and then piece your final square from what you have left over. I know purists will shudder at this – but you’re already chopping fabric apart just to sew it straight back together, so it’s not a stretch to piece the 10th square! Step 4: Sew your squares into rows, and then sew your rows together. Make a backing then baste, quilt, bind and enjoy! The rest of the backing was pieced with Kona Raffia yardage. I have no pattern to share for the backing. Frankly, it was a major pain in the posterior to piece and I won’t be doing it again. It took a lot longer than the quilt top to make and about half way through I cursed myself and wished I’d used a whole cloth instead! Oh well, this is how we learn, right? The one thing I will say is that all those diagonal seam lines were handy for staying on track when I was quilting. There you have it – a Wildwood Crib Quilt, fit for any young bub! Thank you so much to Sew Mama Sew for the Challenge, Cloud 9 for the fabric and Elizabeth Olwen for designing such loveliness. Great job, Kirsty! The quilting adds so much texture and makes it extra special! I love it! 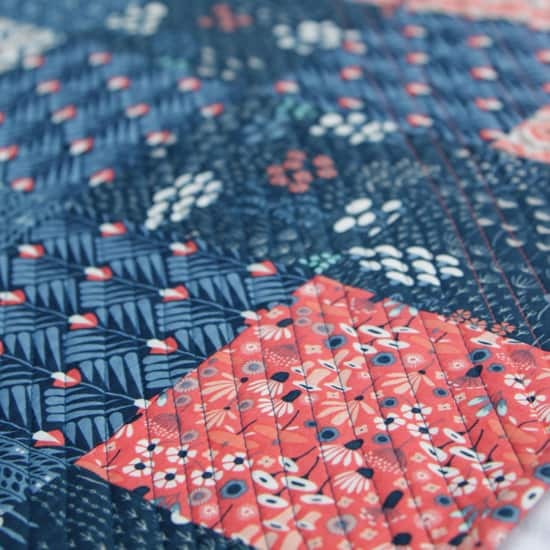 What a beautiful range of fabric- so soft but the navy makes it strong too! Lovely quilt, as usual Kirsty! I like how you let the fabric shine with careful placement. Absolutely beautiful and thanks you for the tips.The bag is just an eye candy!! This is absolutely beautiful! That is a great fabric line. Now that is Really rather lovely … Nicely done m’dear! This really turned out Gorgeous!! Love the fresh look of the Color grading! This is fabulous! I wish I had the patience to sew a quilt. Love that you incorporated the whole line. It’s so beautiful. I loved your quilt and appreciated you sharing the pattern and the process. I loved the backing and quilting designs chosen too! It is truly reversible. Love the baby quilt and the back may have been a pain, but so cute! It’s bold and peaceful at the same time. Cloud 9 fabrics have such a lovely hand! 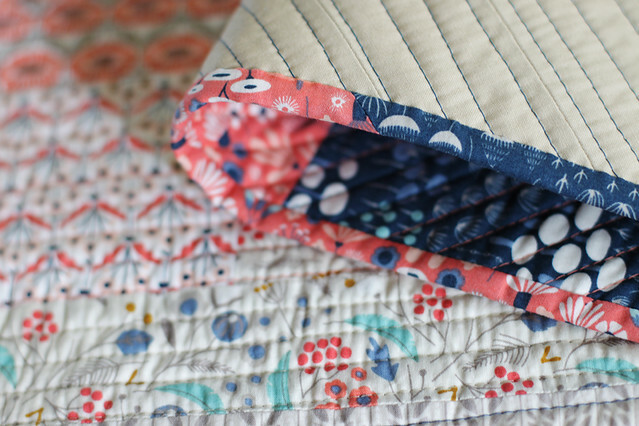 Those fabrics are gorgeous and the baby quilt is wonderful. Simple but a very pretty pattern. Oh my goodness, I love this quilt so much! I must get my hands on those fabrics. I’ve already copied your tutorial to my computer. It’s just scrumptious! Lovely! Such a lovely fabric line. Your quilt is gorgeous! The color gradation is lovely. I also think the back is worthy of being another front . Bonus! I love this fabric, love your quilt- diagonal lines look great! And I’m so glad you had navy and coral thread, it really looks great! I love it i have been looking for a great quilt pattern that uses fat quarters. Nice quilt, good way to tie the back in with the front fabrics. 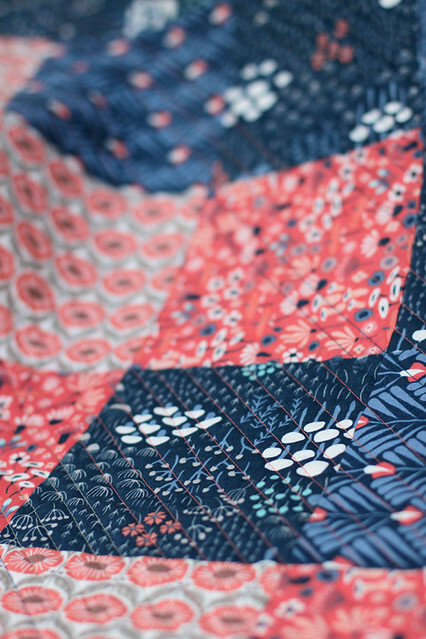 I love this fabric, and your quilt is absolutely beautiful. Thanks! I love your quilt. I have a new grandson coming anyday now, these fabrics would be great for another boy. These are beautiful fabrics. Thanks for showing how you did the layout of the quilt. I like the backing you made too. OH MY LANTA!!! This is absolutely GORGEOUS!! I must make one just like it. Thank you for the tutorial! i like the front but I love scrappy backs, so fun. Such pretty fabric. Love your Awesome Quilt! & colors are Beautiful!! Super job! & backing is cool! Love this quilt. Beautiful job!!!!!!!! 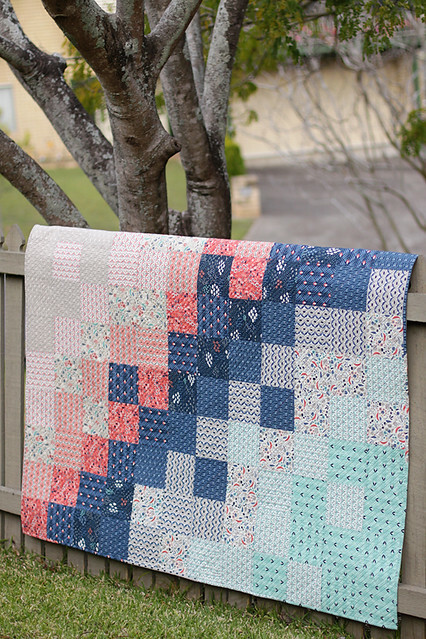 Such a pretty quilt…could use many different fabric lines. Thanks for sharing! 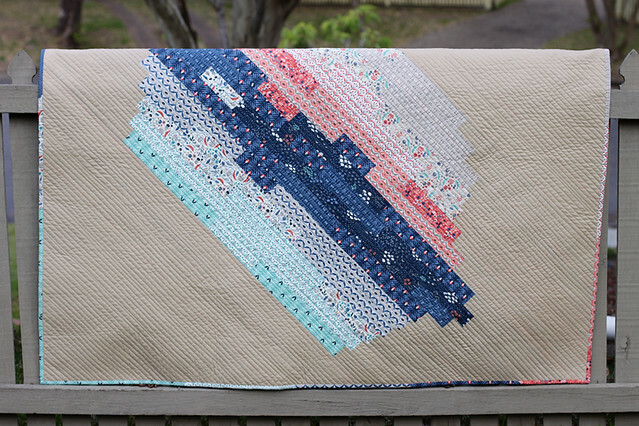 I really like this quilt and it looks easy enough for me to make. Thanks for the tutorial. Well worth the trouble, the backing is just as lovely at the front. Great finish! Wonderful fabric gradation – my favorite color combinations. The back is such a treat to look at too! What a beautiful but simple quilt! Your fabric placement makes it! Love the pattern for a baby quilt. My daughters and nieces like patterns that lean toward the traditional but with an update. This is perfect. The fabric colors are very pleasing to the eye. Thanks for the chance to win as I have more than one quilt to make for the little ones! 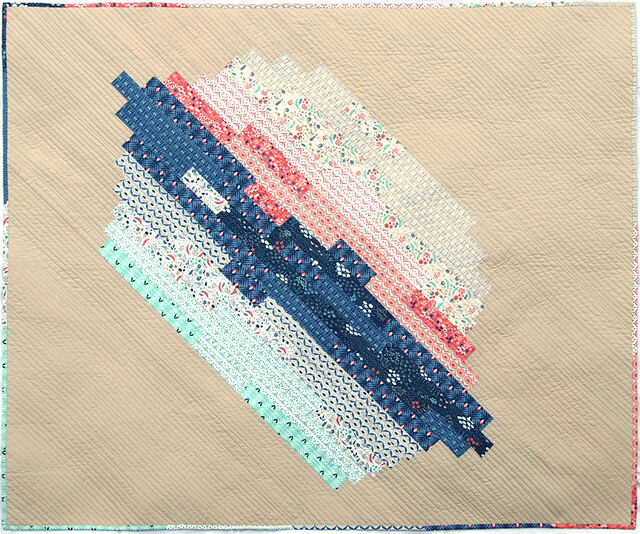 I LOVE the gradation in this quilt. It is sooo beautiful!! Your quilt is beautiful! I love the placement of the fabric. Wow what a beautiful quilt! The backing is awesome, even though it was a pain to piece::So Worth It. Absolutely beautiful! Loved how you made a simple quilt so unique! Kirsty this is a wonderful pattern to showcase fabric. I love the way you do colour graduation and your patterns are so detailed and well written. Gorgeous! I love the back, but I can see how it was probably a royal pain to make. Beautiful quilt, thanks for the tutorial! I love this quilt. I can’t wait too make it. Very pretty quilt. I love the colors and your scrappy binding. Beautiful quilt! I love the backing and it definitely was worth the hard work, it’s brilliant too! Thank you for the pattern. Oh do I love your quilt!! Beautiful quilt, love how you did the back! I love pieced backs! Beautiful, loved the front and oohhed and awwed over the back! Your quilt is great! I really would like to make one like it. Thank you for sharing the pattern. I think you did a great job of showing off Wildwood in an inventive way. Wow – your quilt is beautiful! The colour graduations make such an impact – I love that the simplicity of the design actually gives it such complexity! 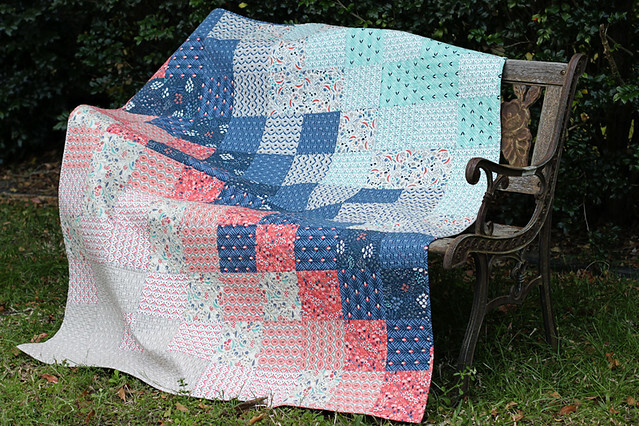 Beautiful quilt and love the fabrics! I love the simplicity of this quilt, but the back is even more over the top. Great job! The back of your quilt is fabulous! The front showcases the fabrics, but the back just pops, and was well worth the time and agony you put into it in my opinion (although I wasn’t the one doing it, so I guess I would say that! 🙂 Thanks for sharing! 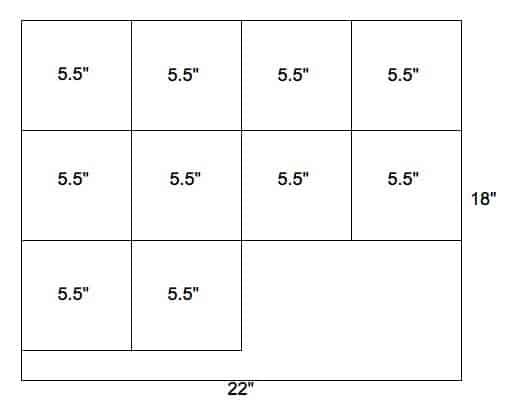 I love the pattern, but discovered after ordering a fat quarter bundle from Hawthorne Threads that you can not cut four blocks 5.5 inches square from the 22 in side of the fat quarter. The fabric is exactly 22 inches wide, but once you cut off the salvage you are short one block by almost an inch. I was able to order another fat quarter bundle to complete my quilt. However, some people might nigh be able or want to invest in another $40 plus to complete the pattern. Hi Donna, I’m sorry your fat quarter wasn’t fat enough! (Sorry, bad fat quarter joke). 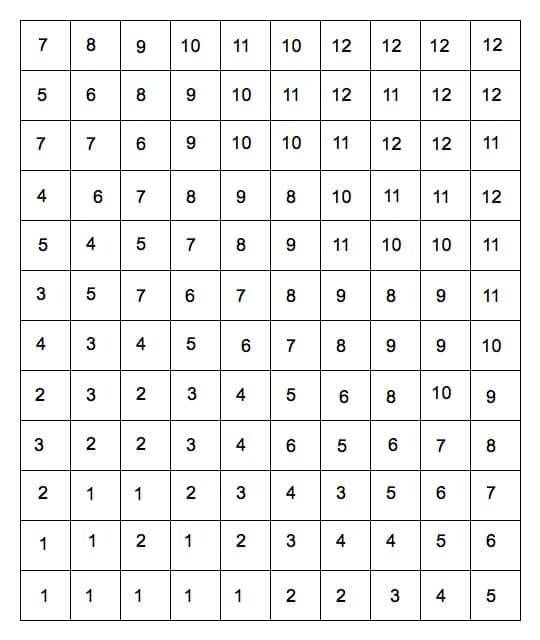 One other option to maximise your FQ is to cut your squares in a 3×3 configuration and then piece together the 10th square. Some people only want to cut ‘complete’ squares, (which could necessitate the need for more fabric) but if you’re comfortable with piecing that last one you can make it all fit. All the best and happy sewing!